Celeste Yacoboni is a Minister of Walking Prayer, ordained by the Center for Sacred Studies. Her intention is to celebrate the spirit that unites us and to inspire those seeking to connect to a higher purpose. Celeste guides people through transitions into deeper awareness and new possibilities. 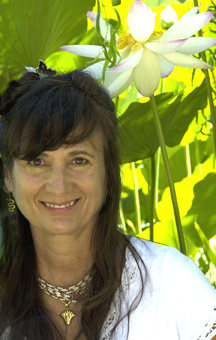 She facilitates wholeness through Massage Therapy, Chi Nei Tsang, Qigong, Women’s Breast Therapy, Plant Essences, the Hawaiian practice of Ho’oponopono and the inquiry, How Do You Pray? The image of Celeste and the Lotus symbolizes her core intention: To guide you to realize your original nature so that you heart opens like the petals of a Lotus flower and your words and actions emanate the sweet fragrance of compassion and love. "Know thy Self and know all."